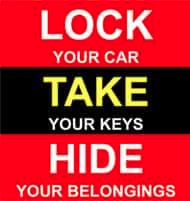 An unlocked sport utility vehicle with its keys left inside was stolen from the driveway of 19 Sylvan Road on Sunday, Nov. 25, police were told by the owner, who was visiting a friend. State police published this image on social media earlier this year. The SUV, a 2011 BMW X5, was last seen in the driveway at about 9 p.m., the victim told police. She said that by 11:45 p.m., not three hours later, she realized it was missing. Inside the SUV was a pocketbook in which she had her driver’s license, bank cards, about $1,000 in jewelry and $300 in cash. Another BMW X5, also unlocked and with its keys inside, was stolen in town 12 days before the one on Sylvan Road. This one was parked overnight from Nov. 12 to 13, Monday to Tuesday, outside a house at 22 Dubois St. and last seen at 7 p.m. By 6 a.m., the victim told police, she realized that the SUV was missing. By 6:08, she was on the phone to police. In this case, police detectives contacted “BMW Assist” a service that was able to locate the X5 parked at 47 Stanley Street in New Haven. Detectives went there and conducted a detailed examination for evidence. 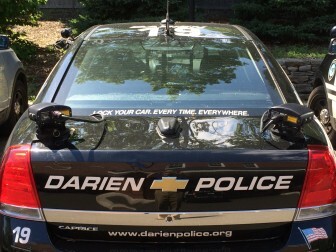 In the vehicle they found a driver’s license for a Waterbury resident (quite a few overnight vehicle thefts in Darien in the past year have been found in Waterbury, where teenage thieves have traveled to various towns opening unlocked vehicles and stealing items from them, or stealing the vehicles when keys are found). The owner made arrangements to retrieve the vehicle. The victim reported the theft to police at 10:19 p.m. on Nov. 12. 125 Holmes Ave. — Glove boxes and center consoles were open in both a Toyota Highlander and a Subaru Outback. 124 Holmes Ave. — A vehicle’s passenger side door was found ajar and the center console open. 130 Holmes Ave. — The passenger-side door of a Honda Pilot was found ajar and the console and glove box both open. 11 Holmes Ct. — The interior of a Jeep Cherokee was found to have been rifled through. For two weeks, a 2018 Jeep Grand Cherokee sat in the driveway of a Sunswyck Road home, and the owner told police that she believes it was locked and the keys weren't in it. But when she found at 5 a.m., Tuesday, Nov.